The design team gathered in the Argyle Street storefront before the ribbon cutting. Team members Victoria, Quintin, Clancy, and Jaime were writing their scripts for the ceremony. 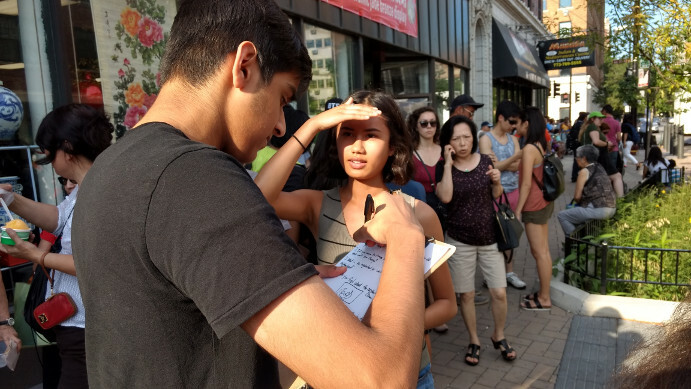 We started counting the number of young people who had been involved in the creation of “UP-Lifting UP-Town,” a public artwork, and Territory’s first commissioned wayfinding device: “Let’s see… sixteen last summer, five in the fall, five in the spring, thirty-nine this summer…” Given a few repeating team members, we decided on fifty. 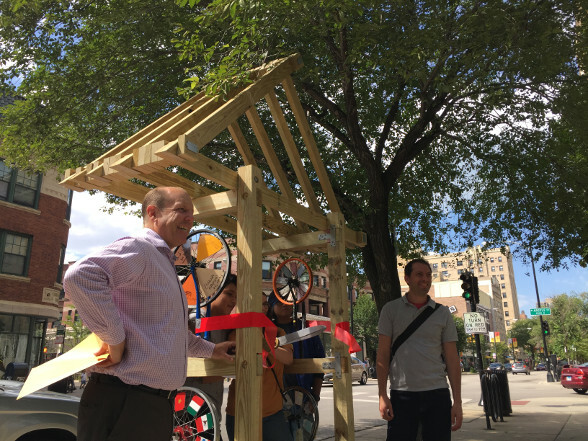 The week before the ceremony, five of us gathered on the sidewalk in front of the Castleman Apartments to install the piece, an 11-foot tall wood frame on skids capped with an oversized gable. It is meant to look like an up-pointing arrow, and from far off it does. On approach you can see that the front and back faces of the arrow are connected with cross bracing that supports the gable. Inverted bicycle forks project up from the cross bracing. Each fork supports a bicycle wheel which spins freely on its axle. Custom cut plastic shapes are attached to the spokes. These shapes incorporate bright colors, “QR” codes, and written prompts to help visitors engage with each other and their surroundings. Hand cast concrete disks painted in pastel shades are stacked, six on each skid leg. Their weight holds the whole assembly in place. The day before the ribbon cutting, passers by spinned the wheels and offered suggestions as we tinkered with the installation details: “What is it supposed to be?” “It feels like a house.” Some wanted to see our permit, others wanted to know how we paid for it and who was involved in the design process. UP-Lifting UP-Town is doing its job: people are stopping, spinning the wheels of fortune, and having conversations with strangers. As one of Territory’s design team facilitators, I am inspired by the designers of this arrow: they are self-motivated creative problem solvers. 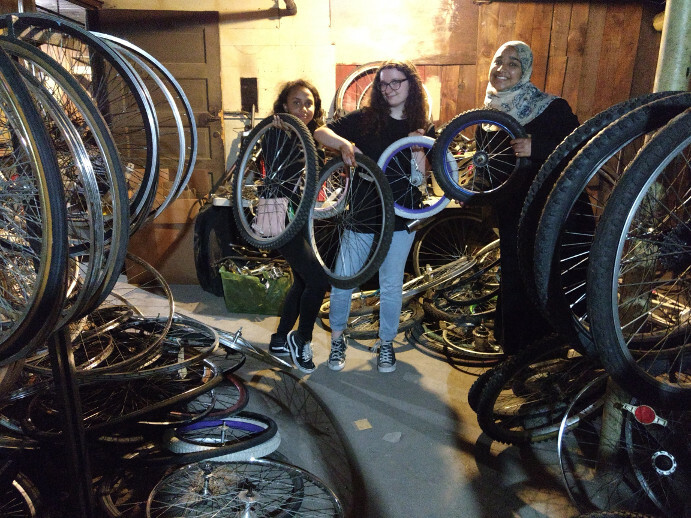 They are 14 to 18 year olds who have played a part in a collective design project completed in phases, taking 12 months from start to finish. Design Process: Empathy (Summer '17) Interviewing neighbors at the Night Market. 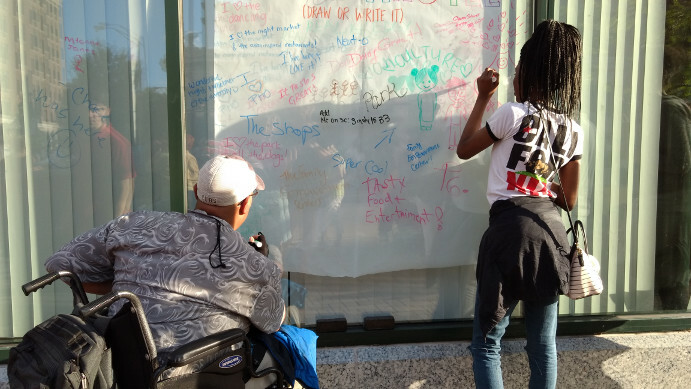 Design Process: Empathy (Summer '17) Getting feedback on our "white board"
Design Process: Discovery (Summer '17) "Our neighborhood needs a landmark where people can gather and interact year round, because there isn't one." Design Process: Test (Summer '17) The arrow debuts at the Argyle Night Market. Design Process: Reflect (Fall '17) Community presentation - proposed sites. 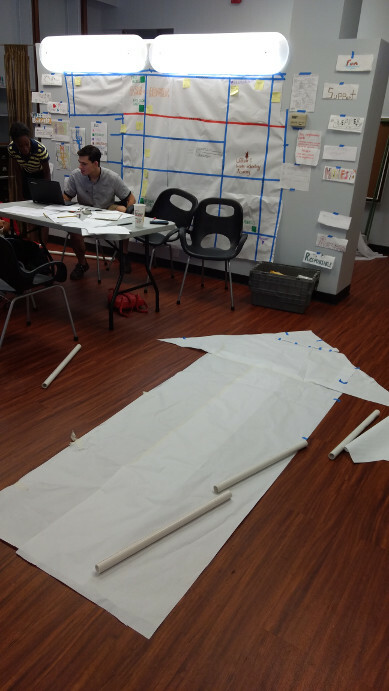 Design Build (Summer '18) Working with architects on the construction details. Design Build (Summer '18) Collecting materials. Design Build (Summer '18) Finishing the wood pieces for the frame. Design Build (Summer '18) Moving the finished wood to the construction site. 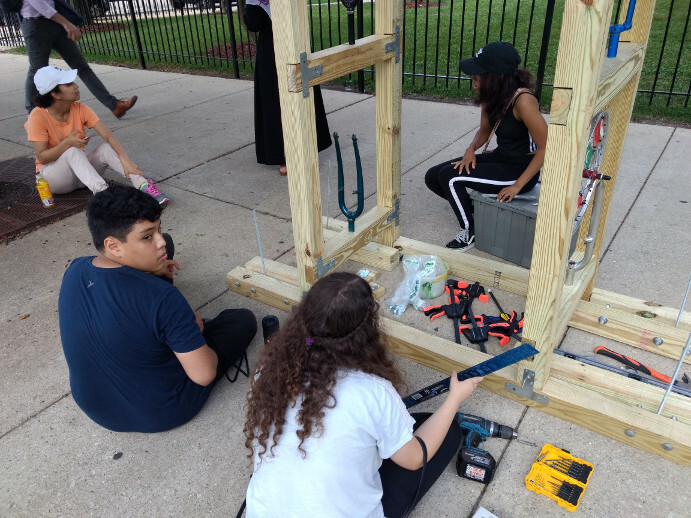 Design Build (Summer '18) Assembling the wood frame for the arrow. Design Build (Summer '18) Painting the concrete disks for the arrow ballast. 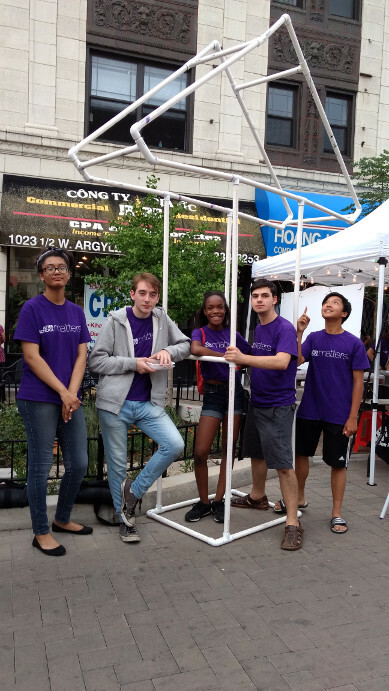 Ribbon Cutting (Summer '18) Celebrating the completion of "UP-Lifting UP-Town"
In Summer 2017 our team in Uptown created three design concepts for public art. 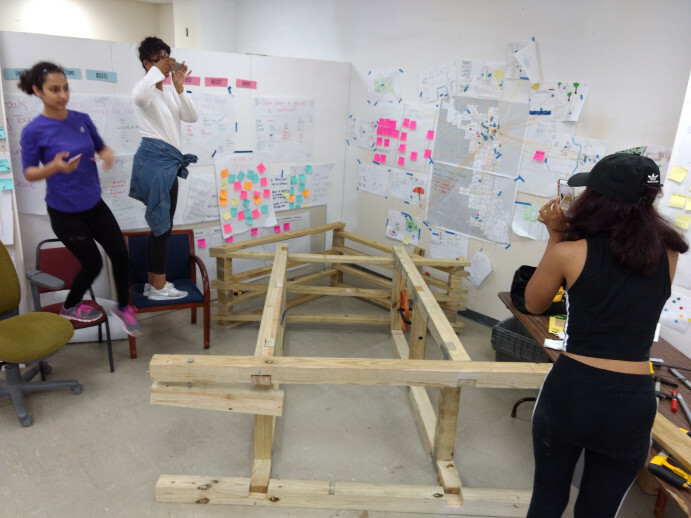 Their concepts, collectively called “Gather Interact Attract” incorporated interviews, research, and testing with community members ranging from the artists collective Axis Labs to fourth graders from Chinese Mutual Aid Association. 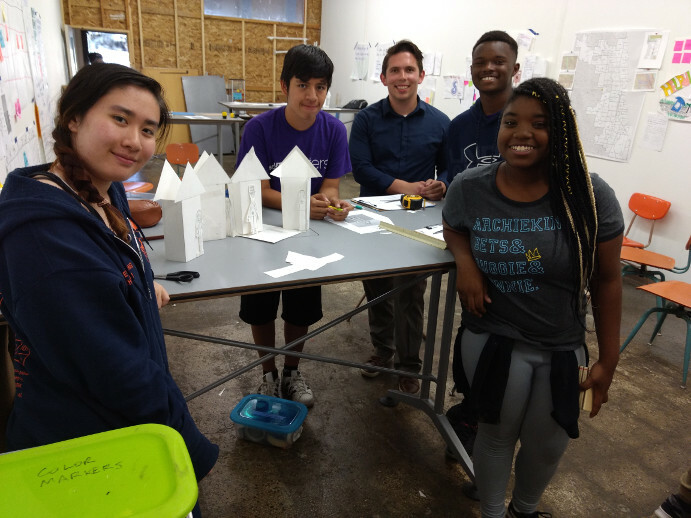 The team held a culminating test including full size prototypes of their concepts at the Argyle Night Market. 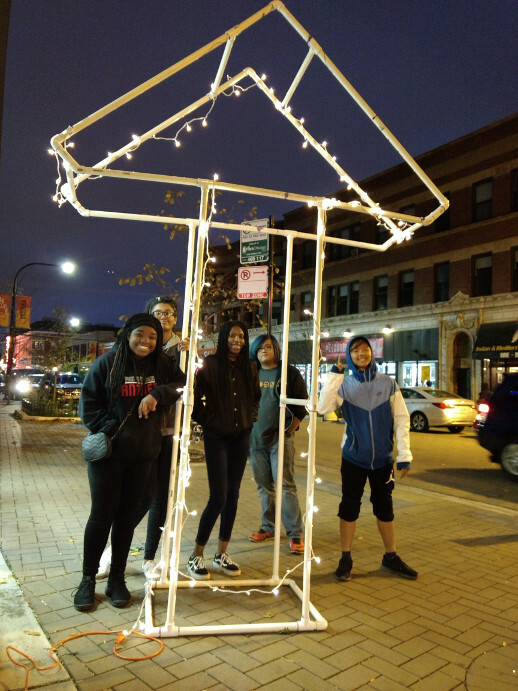 In the Fall, with the support of Alderman Osterman and the 48th Ward, our advanced apprentices combined three ideas into one “UP” arrow, an eye-catching attraction. 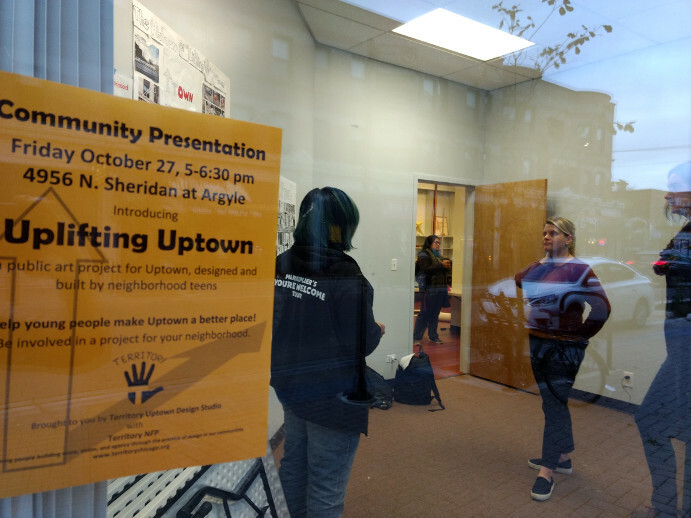 They scouted sites along Broadway and Sheridan, finally settling on Sheridan and Argyle, which they called “the greener side of Uptown.” Over the winter they created a proposal to build the arrow. 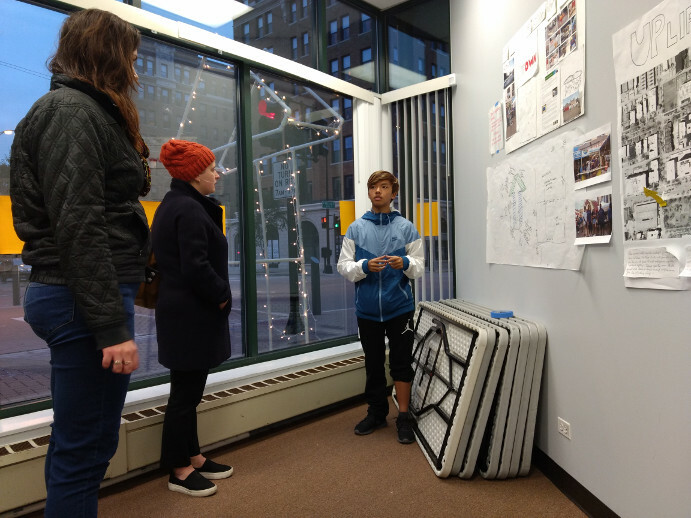 In May Uptown United’s public art committee reviewed, approved, and funded the team’s proposal. By July we had a permit from the city to install it on our chosen site. Over the summer of 2018 two Territory design teams worked with hands on partners from Wheeler Kearns Architects and Worn Jerabek Wiltse Architects to engineer and build the sculpture. Our team in Albany Park participated in a series of design build days with the two architecture firms. 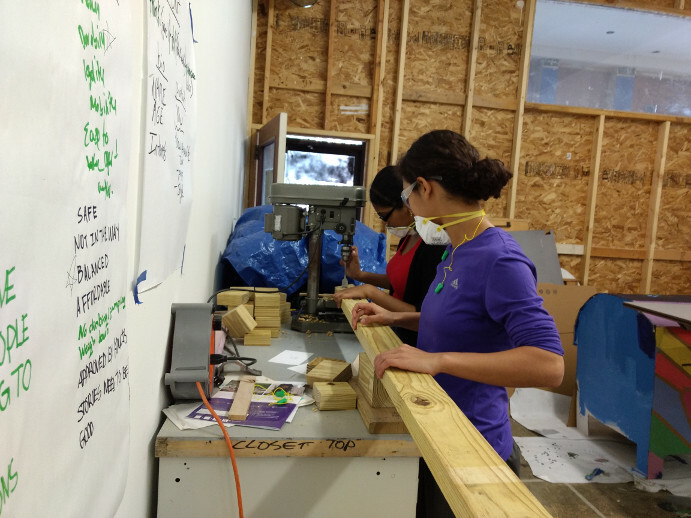 Together they created quality assurance plans for the installation, built full scale details, tested, measured, cut, drilled, chiseled, and finished all of the wood parts in our studio. 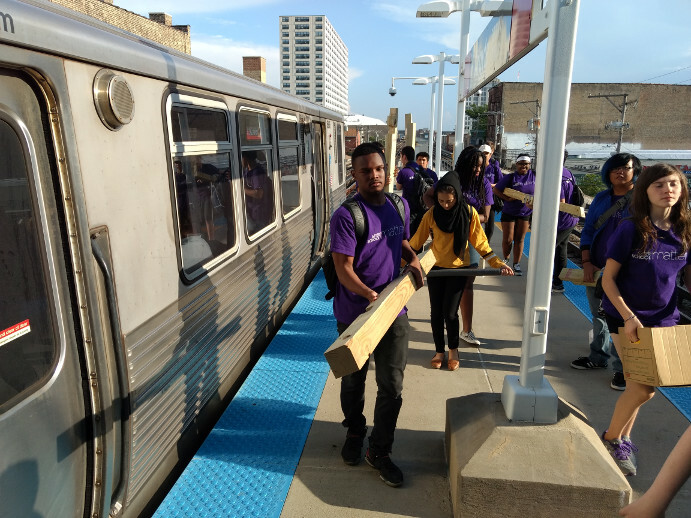 When the pieces were ready, the team hand-transported them from Albany Park to Uptown on the CTA train. 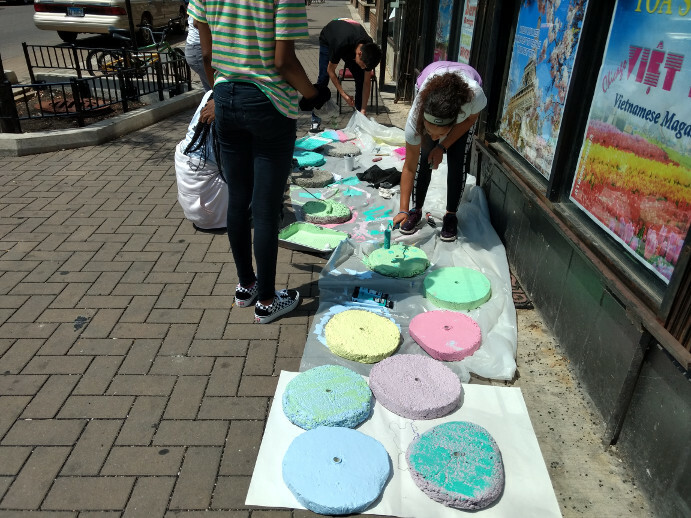 Our Uptown team, 20 high school freshmen doing their first summer job, worked at a storefront on Argyle Street that we shared with the 48th Ward. They designed the spinning wheels, and cast 24 concrete disks using hand made forms. 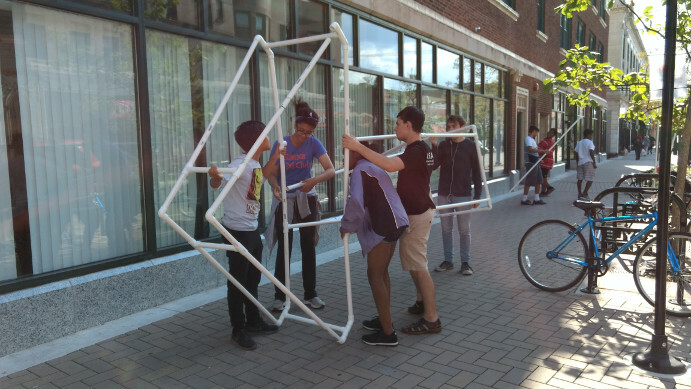 When the arrow arrived on Argyle in pieces, our advanced apprentices worked out the fastening details, assembled all the components in the storefront, and tested the assembly outside. The strength of the project depends on our partnerships with all of the organizations mentioned above. In addition, we want to recognize After School Matters, Alternatives Inc., Bikes N Roses, City of Chicago Department of Cultural Affairs and Special Events, Goodfriend Magruder Structure, The Latin School of Chicago, One Summer Chicago’s “Chicagobility” Program, The Recyclery, and Territory’s Board of Directors for funding and/or essential behind the scenes support. 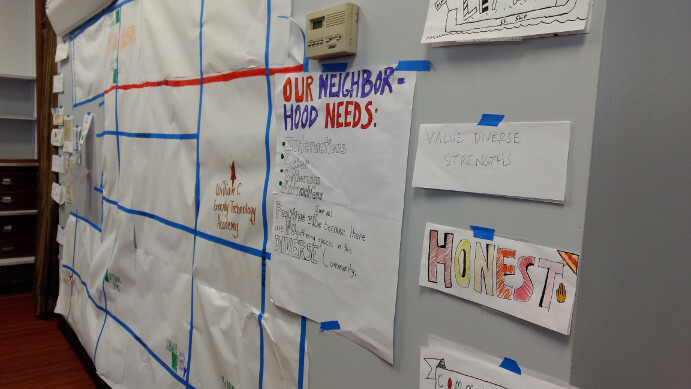 Beyond the 50 team members, more than 30 adult volunteers shared skills, heavy lifting and enthusiasm to help Territory complete this act of civic engagement through urban design. We can’t name everyone here, but know that we could not have done it with out you! 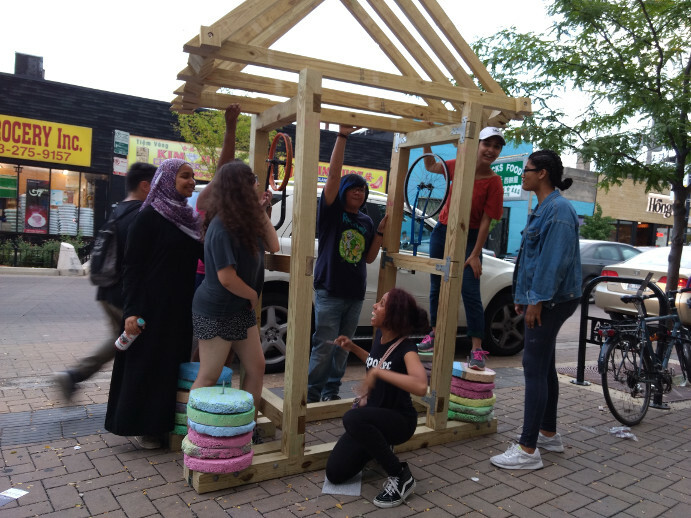 “UP-Lifting UP-Town” is installed semi-permanently at 4949 N. Sheridan Road, on the east side of the street, south of Argyle Avenue in Chicago’s Uptown neighborhood. Visit any time.